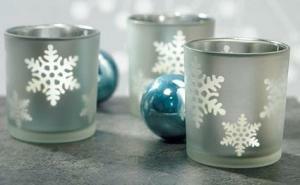 Winter village candle holders can be a lovely seasonal decoration during the holidays. There are many types of candle holders available that can coordinate with a decorative village, and by using them appropriately you can add warmth, light, and vibrance to your village display. Buildings: Some village buildings are specially designed as large candle holders, and the candle's light creates warm, glowing windows for a dramatic effect. Churches, homes, and toy stores are popular building types that often use candles. Bridges: An arched bridge is a popular candle holder for village displays. Depending on the bridge size, one or more candles may be centered in the span or anchoring each edge of the bridge. Integrated Accents: Many candle holders are designed to fit seamlessly into the village décor as part of the scene. Outdoor fire pits or campfires as part of nativity scene are popular choices, or a trash can with figures warming their hands near the candle's flame can be a unique option. Whimsical Accents: Some village accent pieces are designed as candleholders and can add a touch of warmth to the scene. Pine trees and snowmen are the most popular styles. Single Candle Holders: A single candle holder, usually for votive candles, may be etched with a silhouette village scene around the circumference, creating an entire lighted village in one simple decoration. Miniature Villages: A miniature winter village centerpiece may have integrated candleholders for tea lights, votives, or taper candles. While these centerpieces are less able to be customized, they can be just as delicate and detailed as any larger arrangement. 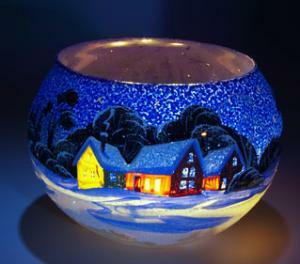 Many specialty retailers offer decorative winter villages for sale during the holidays, including different types of coordinating candle holders. Check holiday retail and gift stores for new pieces each year or browse vintage and antique shops for more unique village buildings and collectibles. If you cannot find the right candles to include with your winter village display, it is possible to add your own candles to the scene. Choose simple clear or frosted glass candleholders to nestle among the buildings, or opt for winter themed candle holders with snowflakes or icicles etched on them. When using your own candles to add to the village, however, be sure to use them safely and appropriately to avoid any fire hazards or damage to your figurines and village collectibles.For an even more whimsical seasonal touch, consider using scented candles to enhance your village display. Pine, sugar cookie, peppermint, and gingerbread scents are especially popular. A low mantle or hearth where the details of the scene will be visible. As a centerpiece on a large dining or coffee table. On a window seat or table in the window so the scene can be seen from outside. Winter village candle holders can be attractive decorations, but they must always be used appropriately to ensure safety. Use only appropriately sized candles in each holder. Candles that are too large or too small may create unintentional hazards or could burn erratically and damage the village pieces. Place candles in the appropriate holders. Do not try to add candles to village buildings or accents that are not designed as candle holders. Check all warnings associated with candle holders to ensure there will be no damage to the figurine if candles are burned. Monitor wax drippings to be sure they will not hurt the village pieces, many of which are intricately detailed and can be dulled or damaged by hot wax. Keep candles away from flammable or delicate parts of the village display, such as strings, thin wires, faux pine trees, snow cloths, and electrical cords. Never leave burning candles unattended, and keep all candles and village displays out of reach of children and pets. Winter village candle holders can be a lovely part of any holiday display if they are used appropriately. Choose the best candles to coordinate with your display and burn them safely for a memorable decoration that can be enjoyed throughout the season.